Want a discount? Become a member by purchasing Needle Felting Academy Annual Membership, or log in if you are a member. The tool I recommend to all of my needle felting students. The needle is easy to switch out when it wears out and it is easy to hold in your hand giving you precision control. With this Single Needle Felting Tool the working tip of the needle is in the exact center ensuring a constant working position related to your fingers every time you pick up the tool. The ergonomic design ensures that the tool fits the user’s hand comfortably, with the entire needle shank held within the tool, providing the shortest distance between fingers and felt. Requiring minimal gripping effort, this tool provides you with a high level of control and precision in your work. The automatic centering of the felting needle allows easy, fast and safe insertion and removal of the needle. The precision machined needle slot provides secure seating for the needle which is held in place by simple rubber rings ensuring positive location. Snowy Creek Needle Felting Tools are unique precision machined light-weight aluminium tools for all your hand felting work. Always have the tool pointing away from your body when inserting or removing the needle. First support the holder in both hands with the slotted end away from your body. Use both thumbs to roll the “O ring” away and out of its groove towards the head of the tool, sliding the ring till it is loose on the body of the tool. Next, hold the needle by its head and slide the tip away from you under the loose ring, into the slot and through the inner ring. Then hold the needle where it protrudes from the tool and seat the needle head at the back of the slot, rotating the needle to secure it. Lastly, slide the “O ring” back up the tool into its groove covering the needle head. 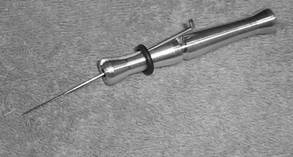 For positive location the needle must remain rotated. Roll and slide “O ring” towards head of the tool as before, now apply light pressure to the needle towards the middle of the tool where the needle protrudes from the holder, this will lift the needle head from its groove allowing the needle to be withdrawn. Learn to Needle Felt the Easy Way! a needle felting sculpture artist, raising my own flock of sheep and teaching others how to needle felt as well as sharing my farm experiences. ~Sheep, wool, farm-life, spinning, dyeing, knitting is what I love. My mission? To help others learn to needle felt the easy way. I have helped over 10,000 learn how to needle felt through my needle felting kits and even more who have received personal instruction from me through my Online Needle Felting Academy. Now it’s your turn! I would love to help you get started today! Join the Bear Creek Needle Felting Academy today! 4 Needle Felting Secrets to save you time, money and headaches.